^ Rhea, Battle of Cold Harbor, p. 38. ^ a b Jaynes, p. 154. ^ a b Jaynes, p. 156. ^ Rhea, Battle of Cold Harbor, p. 42. ^ Rhea, Cold Harbor, pp. 360-61. ^ Rhea, Battle of Cold Harbor, p. 45. 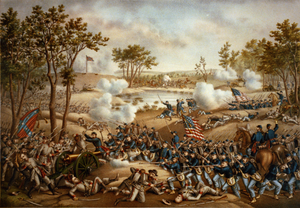 ^ Rhea, Battle of Cold Harbor, pp. 45-46. ^ Rhea, Battle of Cold Harbor, p. 47. ^ Rhea, Battle of Cold Harbor, p. 48. ^ Rhea, Cold Harbor, p. 386. ^ Richmond Then and Now website.